This Thanksgiving holiday, more than 13 million Americans will travel to spend the holiday with friends and family, leaving their homes empty for opportunistic burglars. Follow these safety tips to ensure your family’s safety this Thanksgiving. Remove fall-related objects that might allow access to your home. For example, ladders used for cleaning leaves out of gutters can be used to enter a window or scale a fence. Turn your telephone ringer down so no one outside can hear repeated rings; and review your answering machine message to make sure it does not imply that you are away. Make sure to have all mail, newspapers, and deliveries stopped or picked up by a neighbor, friend or relative. Don’t post Thanksgiving travel plans on social media letting people know that you will be out of town. Never leave a key hidden outside. Burglars know all the best hiding places. Secure all windows, including those upstairs and reduce the chance of easy entry by cutting tree limbs away from second-story windows. Have a friend move your car occasionally if it is parked in the driveway. Use timers to operate lights while you are away for Thanksgiving. Consider installing a home security system, that allows you to check on your home remotely and even arm and disarm your system from any laptop, cell phone, or other web-enabled devices. 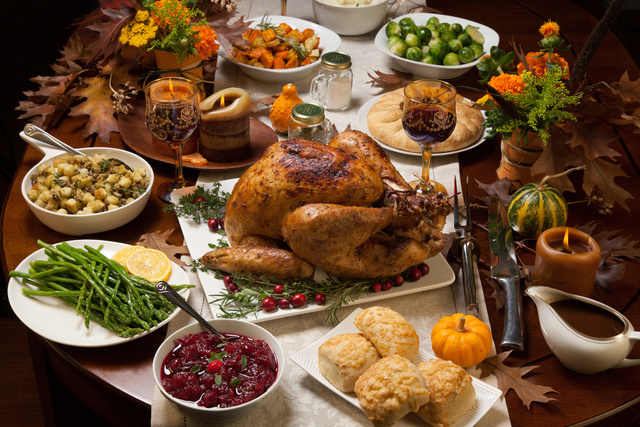 According to the National Fire Protection Association (NFPA), Thanksgiving is the leading day for home-cooking fires. Please follow these fire-safety tips to ensure everyone has a safe and healthy Turkey Day. Be sure to keep a fire extinguisher in the kitchen in case of emergency, and teach your family how to use it. Be cautious when using turkey fryers as they pose a number of distinct safety concerns, including burn and fire hazards. Never wear loose fitting clothing when cooking. Long, open sleeves could ignite and catch fire from a gas flame or a hot burner. Wear short, close fitting or tightly rolled sleeves when cooking. If you found this information useful, please check out our blog for more articles like this. Have a fun and safe Thanksgiving holiday!